Today has been marked on the calendar for about nine months now. I circled it last September and have been ticking off the months, and weeks, and then days until it finally arrived. It’s a big occasion because today is the day I graduate from law school! It took four years, because I went to class at night after Ryan got home from work, and it feels like both an eternity and an eyeblink since my first evening of Civil Procedure, my heart pounding with fear and excitement at the thought of being called on to brief the cases we’d read for class. In all honesty, I don’t feel like I need a celebration because, for the most part, I really enjoyed it. There was that horrible semester at the beginning of my second year, though, that makes my head pound just thinking about it. Four months of staying at school until 1am every Friday night to finish sourcechecking for law review, then up at 5am to study before my daughter woke up. Ugh. I never want to relive that fall again. Other than that monstrosity, (and, OK, I’ll be honest, one or two boring classes), I loved it. Learning about the legal underpinnings of our society opened my eyes to understanding life, politics, history, and human behavior in a whole new way. Before I bore all of you too much, though, I’ll get on with the important part of this: The celebration food! 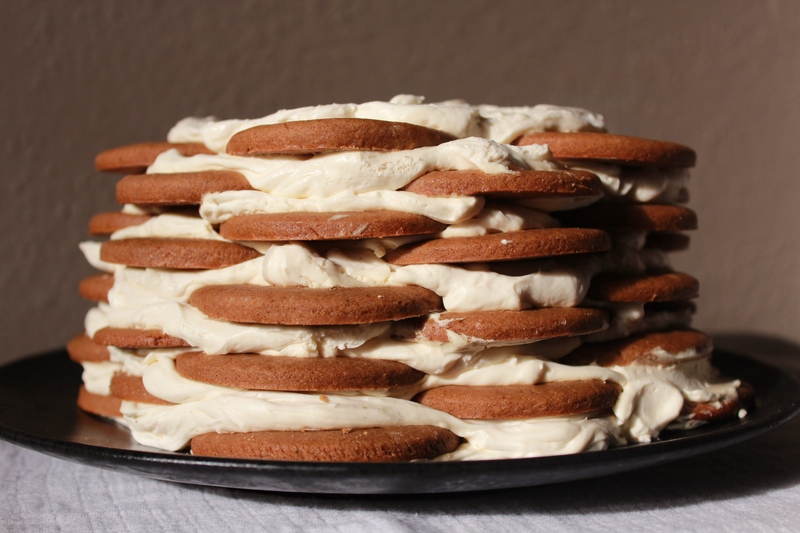 This called for a dessert to beat all desserts, and, after checking out from the library, and drooling over, Julie Richardson’s Vintage Cakes about thirty times, I knew it would be one of her recipes. (If the rather severe looking librarian from my branch is reading this, rest assured I did not actually drool on the book. Just next to it.) If you haven’t read Julie’s book yet, check it out. Even if you’re not going to make anything out of it. (Hopefully, I’m not the only person out there who periodically checks out recipe books with no intention of actually using them to cook something. To me, they’re like picture books for grownups.) Julie has definitely stolen my heart with this one. It’s full of gorgeous photographs of truly decadent delights, all introduced with fascinating stories about their origins. The first cake I made out of the book had a great little blurb about its history at the White House. 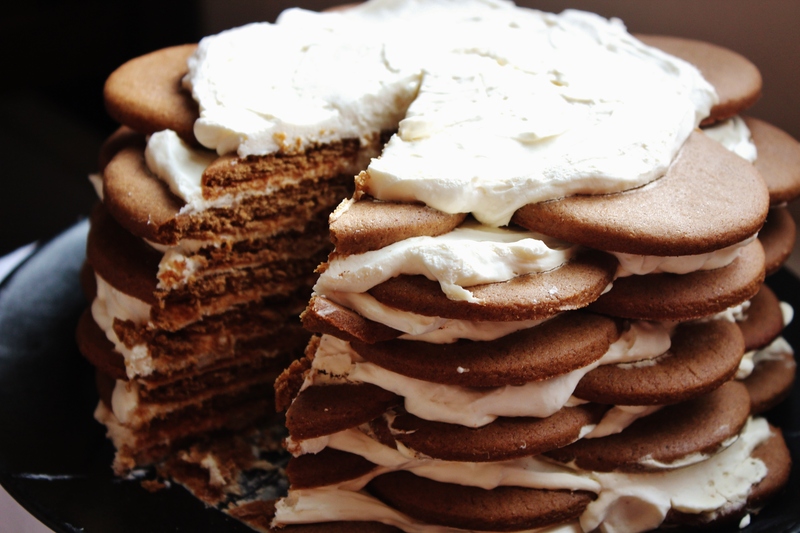 Of all the cakes in the book, though, the Gingerbread Icebox Cake with Marscapone Mousse most intrigued me. 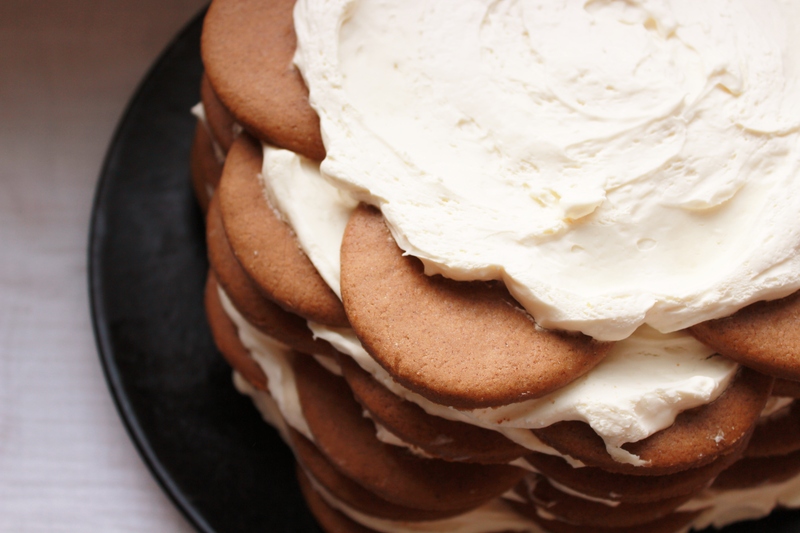 Ginger cookies layered between mounds of fluffy mousse, placed in the fridge (icebox sounds so much nicer, doesn’t it?) overnight, and cut in tall slices of cookies and cream? Pass me a plate! I also, as always, tweaked the recipe just a tad. I have a feeling this will annoy any of you who, unlike me, are real bakers and follow recipes to the “t.” However, if you’re a cheapskate, like me, then maybe you’ll find this useful. Instead of marscapone, I substituted 16 ounces cold cream cheese, 1/3 C cold sour cream, and 1/4 C cold heavy whipping cream. I beat these together in my mixer until light and fluffy, then went straight on with the directions for making the mousse. Also, I could not find blackstrap molasses in time, alas, so I used regular. It was still delicious, but next time, I will plan ahead and get the good stuff. Truly, this was one of my favorite desserts yet. I ate a slice every night for several days, with a steaming cup of Pero. Pure bliss. Perhaps I will go back to school again, if it means justifying another one of these at the end of it. And, if you haven’t already, don’t forget to sign up to follow The Joyful Pantry! Right now, I’m holding a contest: if you sign up before midnight TONIGHT (May 25, 2013), you’ll be entered into a drawing for a $10 Amazon gift card. Look on the right-hand side of the home page for details. In the bowl of a stand mixer fitted with the paddle attachment, mix the butter and brown sugar on medium speed until well combined. Add the eggs one at a time, scraping down the sides and bottom of the bowl between additions. Blend in the molasses. Add the dry ingredients all at once and combine on low speed, scraping down the bowl as needed to create a unified dough. I’m so impressed you finished law school! You inspire me. I always think, “Once the kids are grown I’ll go back to school.” What a great example to push through and do it now. And, your food photography in this post is fabulous. YUM! Congratulations Rosalie! Finishing law school is a big deal.Thank you for letting us know. Make sure you take some time to really let your accomplishment soak in. 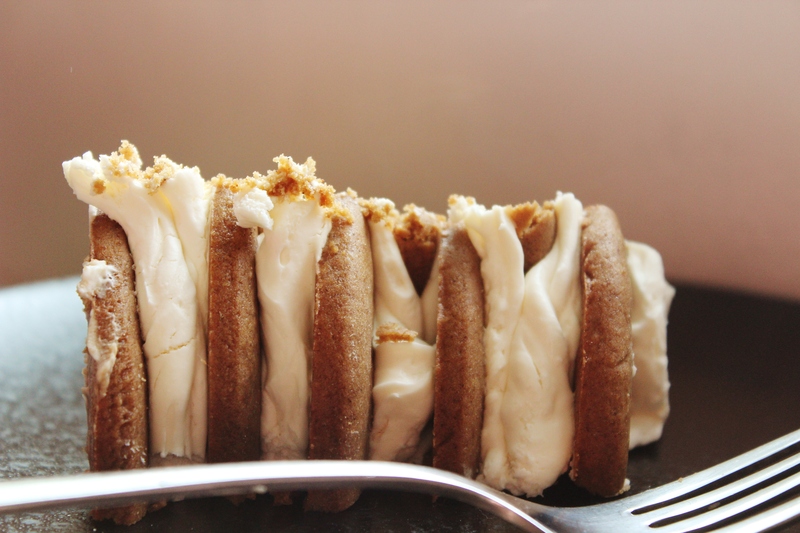 This icebox cake looks super fun! I’ve only seen this technique with chocolate wafers. Yum. Just have to say congratulations!!! Don’t know how you did it but you did it! So proud of you…hope you enjoyed the celebration dessert!!! Congratulations, dearest Rosalie! Lovely way to celebrate!! Congratulations Rosalie! That is so wonderful, you’re my hero! This cake looks delicious too! Oh, Rosalie, I love reading your blog! You always have me drooling (and laughing). This makes me miss you (and your cooking) a lot– more than usual. Thank you all so much for the well wishes! I wish I could throw a party and have you all over for a piece of this cake. 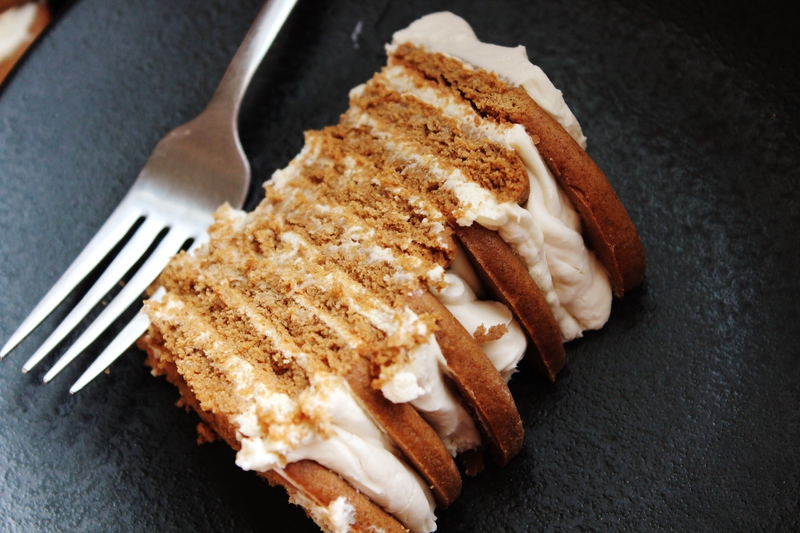 In fact, I wish I had a piece of this cake right now.